Rauff Hakeem is a generous man. A week or so ago, he issued what he referred to as an ‘unreserved apology’ to all Buddhists in Sri Lanka for a remark he made on the campaign trail that some people had interpreted as an insult to the Sangha. Indeed, he didn’t just say sorry. The SLMC leader also praised the pluralism practised by Sinhalese Buddhists from as long ago as the time of King Senarath, who gave Muslims land in the Eastern Province when they were being persecuted by the Portuguese, and acknowledged the patronage and benevolence Muslims had always enjoyed under Sinhalese rule. The media didn’t stint on its coverage of his statement, and the frenzied criticism that both preceded and followed it was also given plenty of attention – Faizer Mustapha, his colleague in the UPFA administration, accused Rauff Hakeem of trying to provoke race riots for political gain. Race riots? He wants a repeat of 1915? Believe that and you’ll believe anything. The funny thing is that there was no such widespread reporting of what the SLMC leader actually said in the first place. The whole episode had very little to do with any offence caused and nothing at all to do with any potential danger to the country – very few people would have come to hear of Rauff Hakeem’s comment if not for the ruckus created by his critics. Instead, it had everything to do with the September 8th provincial council elections, in which the SLMC has decided to go it alone in the Eastern Province. Since Muslims are now a majority in the East, the SLMC is expected to do well, and no doubt it didn’t want to risk the fate of MLAM Hizbullah, who brought his faction to contest with the UPFA in 2008 on the understanding that the community with the most votes would be offered the chief ministerial position, only to see it handed to the TMVP – Tamils won only six seats compared to eight for Muslims. It is actually Faizer Mustapha who should be apologising to Muslims for attempting to take political advantage by raising the awful prospect of race riots. What made all this possible was the use of the phrase ‘saffron terror’, which Rauff Hakeem urged must be tackled as was the LTTE. It is not a very helpful phrase, certainly. Muslims don’t like it when people call Al Qaeda Islamic terrorists, on the basis that Islam has nothing to do with terrorism – just because terrorists claim to be acting in the interests of a particular faith doesn’t mean they should be taken seriously. Predominantly Islamic countries never use the word Islamic in connection with Al Qaeda, in the same way as Anders Behring Breivik isn’t called a Christian terrorist in countries where the dominant religion is Christianity (he sometimes isn’t even referred to as a terrorist!) – indeed, this label is rarely applied elsewhere either, so dominant is the West in the formation of the global narrative. Also, ‘saffron terror’ is the phrase in common use by Indians including the Congress and its now former Home Minister P Chidambaram to describe terrorism by rightwing extremist groups adhering to Hindu nationalist ideology. This is obviously not comparable with anything that is happening in Sri Lanka. Rightwing extremist groups in India have been linked to a series of blasts in the last half decade that together have killed hundreds of people. When a bomb explodes, as happened in Pune on August 1st, the first reaction of the Police is now to acknowledge that it is as likely to be the work of Hindu extremists as it is of Muslim extremists. Even generally speaking, the relationship between communities in the two countries cannot be compared. Race riots are a current reality in India – since July 20th, violence in the Northeastern state of Assam between Muslims and indigenous tribes has claimed more than 75 lives and resulted in 300,000 people fleeing their homes, while there has also been a mass exodus of Northeastern migrants from Southern cities like Bangalore and Chennai due to fears of a backlash. Sri Lanka is much better off. However, this is not guaranteed to remain the case. Given the history, which includes several events like those of 1915, and the fact that the country is just emerging from a generation long war fought by a group claiming to represent one particular community in the face of discrimination and oppression by a chauvinist state, it might be wise to err on the side of caution. More important than how Rauff Hakeem expressed himself is the point he was trying to make. The phrase ‘saffron terror’ as employed by him was meant to refer to the involvement of Buddhist priests in acts of violence against other communities. The Dambulla incident in April this year made the headlines around the world thanks to the availability of rather compelling visuals of monks leading a mob in storming and vandalising a mosque they claimed was built illegally within the declared sacred area of the Golden Temple. Anybody who still hasn’t watched the footage should immediately search for it on the internet (‘Bigoted monks and militant mobs: is this Buddhism in Sri Lanka today?’, Groundviews, April 23rd), since it is bound to change your perspective on the seriousness of the problem. The sight of a monk disrobing and jumping up and down exposing himself outside the mosque while other monks break down the door cannot be forgotten, nor can the explanation given by the Ven Inamaluwe Sri Sumangala Thero that the act of destroying the mosque is actually a shramadanaya in which all Buddhists should participate. Three issues merit repetition. First, the monks used their status to achieve their objectives – the Police were present in numbers, but they did not prevent the monks from breaking the law, although they did restrain lay people. Secondly, their concerns could have been resolved with very little difficulty if they had chosen a different path. The mosque is not like Ayodhya or the Temple Mount. It grew up to serve the Muslims of the area, but there is no desperate attachment to that particular location – it is not the Prophet’s birth or deathplace. Also, the structure itself is more or less makeshift. Putting up a new one in another place wouldn’t have been an unthinkable task before the mob attack inflamed passions. The Government could have negotiated for suitable land outside the declared sacred area. Thirdly and most importantly, Muslim leaders responded very sensibly, moving to reduce rather than increase tensions, ensuring that protests were non-violent. It is a shame that the Government has not apologised to Muslims for its failure to protect their religious freedom on that occasion. 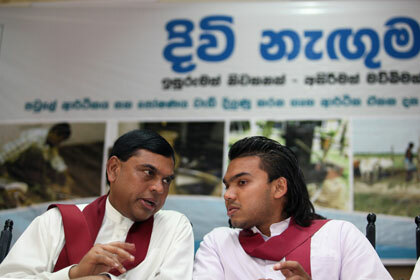 In particular, if saying sorry for statements that some people find upsetting is in order, Prime Minister DM Jayaratne should have done so for responding to the mob attack with an announcement that as Minister of Buddha Sasana and Religious Affairs he was ordering the immediate removal of the mosque – this was hardly the responsible course of action, if there was even the smallest chance of race riots. Meanwhile, the Ven Inamaluwe Sri Sumangala Thero is clearly not going to issue an ‘unreserved apology’, since he apparently believes that violence is a perfectly acceptable way of getting what you want (‘A monk on the rampage’, interview by Niranjala Ariyawansha of the Sunday Leader, May 6th). The Dambulla incident happened months ago, and it may be argued that the damage done by the Buddhist priests was minimal – the mosque is back in operation and the people of the area have resumed their normal practice of peaceful and harmonious coexistence. Indeed, it is true. Sri Lanka must certainly not be castigated as an intolerant society, since to do so would be to ignore the common behaviour of the vast majority of its people and even the general attitude of its leaders. However, there would have been no damage at all if not for the Buddhist priests – they guided their followers in what was very definitely the wrong direction. Also, Buddhist priests continue to be involved in such incidents, while nothing is being done about what looks like becoming a trend in the post-war environment. In the last fortnight alone, reports indicate that a mob led by a Buddhist priest took away a statue of a god from a Hindu kovil in Panama, Eastern Province, while in Deniyaya, Southern Province, another mob including Buddhist priests beat and threatened to kill a Christian pastor and his wife whom they accused of spreading Christianity in the area. These are much worse insults to the Sangha than anything that was or ever could be said by Rauff Hakeem. This article was published in the Midweek Review on 22nd August 2012. The internet version can be accessed here. This article was published in the Midweek Review on 15th August 2012. The internet version can be accessed here. It’s hard to know when to take official statements seriously. The Government isn’t known for taking the quiet, cautious approach. Indeed, its spokesmen very often make obviously false claims, such as that Mervyn Silva hasn’t done anything wrong or that no civilians were killed during the war. They seem to think the public are idiots. When it comes to informing people about their plans, they are equally blasé about the difference between fact and fiction. We can never be sure what to believe. Take the proposed reclamation of land at Galle Face. This project sounded most unlikely when it was first announced back in 2010 – why spend so much money raising the seabed to build more luxury hotels and malls when supply already outstrips demand? Colombo has enough for the number of visitors it gets. But now this mildly ridiculous idea has somehow developed into total lunacy. According to the Chairman of the Ports Authority, speaking at a conference a few weeks ago, the Galle Face reclamation will now include a yachting marina, golf course, centre for water sports and most extraordinarily of all a Formula One racetrack! There are undoubtedly a handful of people in Sri Lanka who would be delighted if this project were to materialise. The problem is that there are millions of others for whom it would be of absolutely no use. Consider the Formula One racetrack. Never mind the capital cost of building the racetrack or even the recurrent costs of maintenance and the organisation and security of the three-day event. These are of course massive. But according to reports in the Indian media – Delhi was home to the inaugural Formula One event in India last year – the licence fee alone comes to $200 million. That’s more than the annual budget of the Ministry of Higher Education. Do Sri Lankans want to watch a few cars driving round in circles for an hour, or might they prefer to have twice the number of universities? It’s a tough one. If visitors didn’t flock to India for the inaugural Formula One event, it is hard to imagine them descending en masse on Colombo to play golf or go jet skiing. There are more attractive parts of Sri Lanka to stay in, to be honest, with less traffic and better weather. So the Galle Face reclamation probably isn’t going to boost the Sri Lankan economy or create jobs – it will simply consume funds that could have been used for something more productive. The project is of course going to be carried out by a Chinese company. Who else? China has been financing more and more infrastructure projects in Sri Lanka in recent years, most obviously in Hambantota, many of them implemented by the China Harbour Engineering Company. On the plus side, the Chinese don’t try to tell Sri Lanka what to do. This makes a refreshing change from agencies like the World Bank, which refuses to lend unless the Government undertakes major reforms to key policies. Want to build a power plant? Tough luck, because they will only give money to the private sector, and then only if the Government promises to buy the electricity these companies generate at inflated prices for decades to come. Meanwhile, tariffs will have to be increased, particularly for home owners, and part of the Electricity Board must be sold off. Some deal! The entire sector has to be transformed for the sake of a few million dollars, which anyway have to be paid back with interest. China only insists on using its own workforce and materials. While this is not very good for Sri Lanka either, and the sight of thousands of Chinese labourers wandering around the otherwise pretty empty countryside of the Hambantota district with their shovels is quite peculiar, it is at least straightforward. 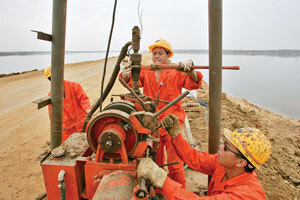 The Chinese are looking for markets for their companies and employment for their people. Again unlike the World Bank, China doesn’t pretend that it is trying to do Sri Lankans a favour – it is here in its own interest. 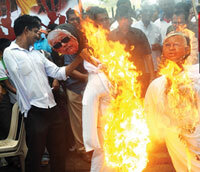 It is up to the Government to decide what Sri Lanka needs. That it is now being suggested – after a series of breakdowns – that the Norochcholai coal power plant may be a Chinese cast-off, neither very good quality nor particularly suitable for Sri Lankan conditions, indicates that people are not at all sure that the Government is doing this job properly. Infrastructure projects are essential for the development of the country, but they can also be a source of little other than debt. The Greater Hambantota Scheme alone is going to cost Sri Lankans billions of dollars, including to date $360 million for the port and $550 million for its associated tax-free zone (because the Government is already overburdened with the taxes of profit-making companies? ), $210 million for an international airport, $15 million for an international convention centre and $9 million for the sports stadium, according to official announcements. Anybody who has visited the area since work started in 2008 cannot have failed to marvel at how out of place these huge structures appear, surrounded as they are by miles and miles of nothingness – no offence intended to the inhabitants of the Hambantota district. Will they be worth the investment? In the case of the sports stadium and international convention centre, it is quite clear that the answer is almost certainly no. These are the equivalents of the proposed golf course and water sports centre at Galle Face – while they probably won’t generate much in the way of benefits for the economy, at least their cost is measurable in tens rather than hundreds or thousands of millions of dollars. What a sad measure of the ‘success’ of a project – how much of a failure it is! The number of conferences and cricket matches to which Sri Lanka plays host is not about to leap up exponentially. As we have seen, to make use of these facilities, events have to be diverted from other locations. Sri Lankans must be hoping that the rather more pricey international airport and port will not turn out the same way. That the first commercial operation at the Magampura Port took place more than 18 months after its ceremonial opening is hardly a great sign. Even less encouraging is that it involved the transshipment of cars manufactured just 500 nautical miles away in Chennai. One wonders how much if anything the Hyundai Group paid for the pleasure of briefly interrupting their 5,000 nautical mile journey to Africa and Europe – the vehicles were offloaded from one ship on June 6th and put on another on June 17th. It sounded very much like a publicity stunt to make the public believe that all is well. However, given Sri Lanka’s position on East-West shipping routes, there is still every reason to hope that Hambantota will attract a decent passing trade in time, at least once the current global downturn has passed. The problem is that nobody is convinced that there is a coherent strategy behind the Government’s enthusiasm for infrastructure development – it all looks a bit hit and miss. The Government seems to think that announcing grand plans is an easy way of boosting its popularity – the public are supposedly impressed by words rather than deeds, hence the surely crazy talk of a Formula One racetrack on the land to be reclaimed at Galle Face. 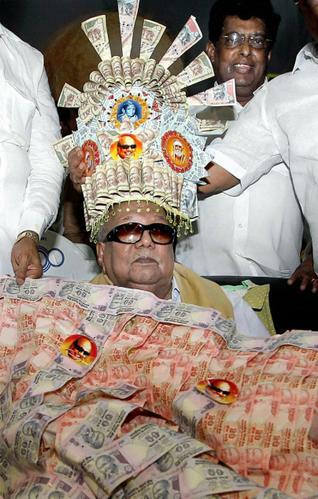 A minister can then unveil a foundation stone that will immortalise his contribution to the nation for all to marvel at for decades to come, and perhaps also pocket a bribe from a Chinese company. And by the time the public realise that it was all a ploy, or that it was madness that resulted in a loss to the country of billions of dollars, they will have forgotten who is responsible. Similar concerns have also been raised with regard to the network of expressways that are already under construction. I too enjoyed the smooth one hour ride to Galle soon after the much-delayed opening of the Southern Expressway, but I didn’t see very many other people enjoying it – they were still travelling by bus on the free coast road. It would seem that the public are finally wising up to the need for vigilance. Soon they’ll be refusing to vote for liars and criminals, and then Mervyn Silva really will be in trouble. This article was published in the Midweek Review on 1st August 2012. The internet version can be accessed here.